Van Ruisdael painted the outskirts of his native city on numerous occasions, using different viewpoints and a range of motifs and experimenting with the perspective and presentation of the view. These broad, panoramic scenes cannot be considered strictly topographical as the artist modified different elements with the aim of achieving expressive images. A posthumous inventory drawn up in Amsterdam in 1669 records one of these views as “ een Haerlempje van Ruysdael”. The fact that the term Herlempje was used has led to the assumption that the model was completely defined with regard to its elements. 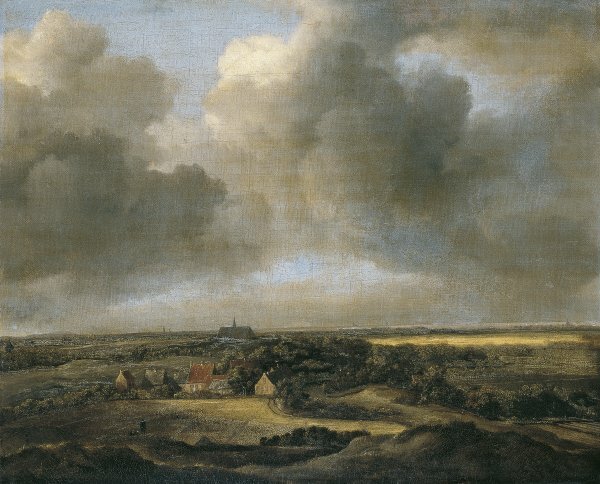 In many of these views, as in the present example, Van Ruisdael depicted fields for bleaching linen cloth, as we can see in the centre of the composition, located in a large field before a group of houses. This flourishing and profitable industry took place on the outskirts of Haarlem using imported raw material. Among the most important elements used in the process was water, and Haarlem water was considered particularly suitable. The presence of these fields in paintings, covered with huge expanses of white cloth, has encouraged symbolic interpretations on occasions. However, a lack of specific references in this regard has led to this idea being largely rejected by experts on Van Ruisdael. Van Ruisdael here presents a view of the city of Bloemendaal, located at the foot of the dunes to the north of Haarlem, and which has been identified by its church in the centre of the composition. The background with an expanse of water that almost blends with the sky is the Wijcker Meer with the river Spaarn. Since it was included in the exhibition held in Munich in 1930 and subsequently in all the catalogues of the Collection, the painting has been considered an autograph work by Van Ruisdael. However, Simon attributed it to Jan van Kessel, a suggestion rejected by Stechow. Gaskell analysed the painting, whose surface reveals old restoration with areas of repainting that have affected key parts of the composition. As a result of his examination he preferred to catalogue the work as attributed to Van Ruisdael but his opinion was not shared by Slive, for whom the distribution of the light and shadow on the surface was strongly reminiscent of Van Ruisdael, as were a series of small but exquisite touches that have survived on the pictorial surface. The painting has been compared to Bleaching Fields near Haarlem, also on canvas, in the Wadsworth Atheneum in Hartford.